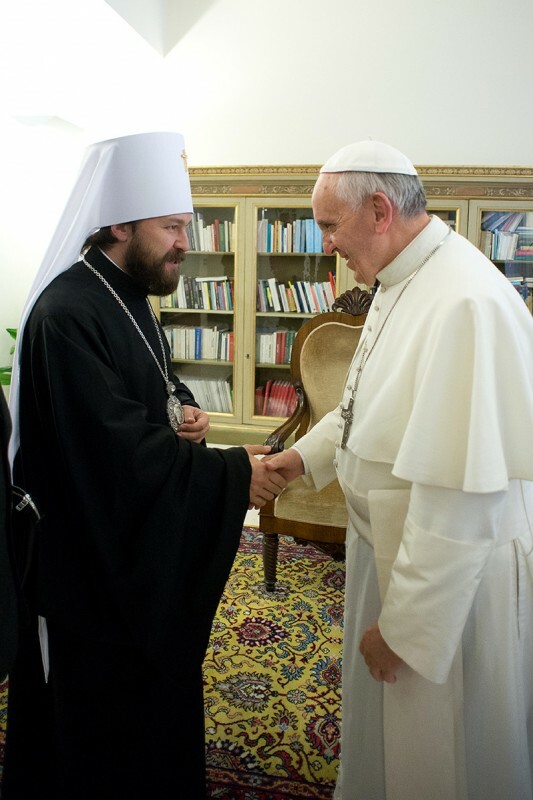 On 12 November 2013, Metropolitan Hilarion of Volokolamsk, chairman of the Moscow Patriarchate’s Department for External Church Relations, met with Pope Francis of Rome at the Vatican. At the beginning of the meeting, which was held in the atmosphere of mutual understanding, Metropolitan Hilarion conveyed greetings and best wishes from His Holiness Patriarch Kirill of Moscow and All Russia to the Primate of the Roman Catholic Church. Discussed at the meeting were different aspects of Orthodox-Catholic relations and the present situation of Christians in the Middle East. Metropolitan Hilarion shared his impressions of his visit to Lebanon, saying that Christians in this country are anxious about their future. Pope Francis and Metropolitan Hilarion noted the necessity of consolidated actions of Christian Churches for protection of Christians in Syria where armed conflict has not abated. The DECR chairman thanked the Pope for his efforts aimed at protecting the suffering Syrian Christians. Metropolitan Hilarion and Pope Francis noted that upholding of traditional family values, which are being revised by the adherents of secular ideology, was an important aspect of cooperation between the Moscow Patriarchate and the Holy See. A conference on ‘Orthodox and Catholics in Common Defence of the Family’ sponsored by the Moscow Patriarchate and the Pontifical Council for the Family due to take place on November 13 testifies to the developing cooperation. At the end of the audience, Metropolitan Hilarion introduced members of the delegation that accompany him and presented Pope Francis with a pectoral cross made in the Moscow Patriarchate’s workshops and the first volume of his book ‘Orthodoxy’ in the Italian language. Pope Frances presented Metropolitan Hilarion and members of the delegation with a medal coined in honour of the first year of his pontificate.